MIAMI (CNS) — Step into the principal’s office at Epiphany School in Miami, and you’ll think you’ve entered a shrine for the Philadelphia Eagles. And you’ll be right — as you scan the banners, blanket, desk, chair and other items, all in the green and silver hues of the pro football team. But Sister Margaret Fagan got the crown jewel for fans on Jan. 26: a ticket to Super Bowl LII Feb. 4, when the team will face the New England Patriots in Minneapolis. “I’m still in shock,” Sister Margaret said some days after being given the ticket before cheering students, parents and teachers. “It is beyond my wildest dreams,” she told the Florida Catholic, Miami’s archdiocesan newspaper. Sister Margaret’s office can seem like a souvenir shop for the team. Over her 14 years at Epiphany, she has collected team items, including cups, dolls, hats, socks, Croc shoes, plates, napkins, blankets — most of it gifts from school parents. After the Eagles beat the Minnesota Vikings and secured a spot at Super Bowl, parents began talking about doing something for Sister Margaret, said Caroline Murphy, a technology teacher at Epiphany. They started chipping in money, and some used connections with the Eagles and Super Bowl. Teachers launched their own fund to raise spending money for Sister Margaret. By Jan. 26, about 85 people were in on the plot, Murphy estimated — yet no one tipped off the sister. “I thought it was going to be a rally for the Eagles” when she was called out into the school yard, Sister Margaret confessed. Instead, Msgr. Jude O’Doherty, Epiphany’s pastor, presented her with an envelope — and on opening it, she threw her head back with amazement as the 900 students cheered. “Better pack your bags,” said Father Alex Rivera, parochial vicar at Epiphany, handing her a small suitcase bearing an Eagles bumper sticker. Then the public address system struck up the Eagles’ fight song. The episode was just the latest surge of fandom at Epiphany School. 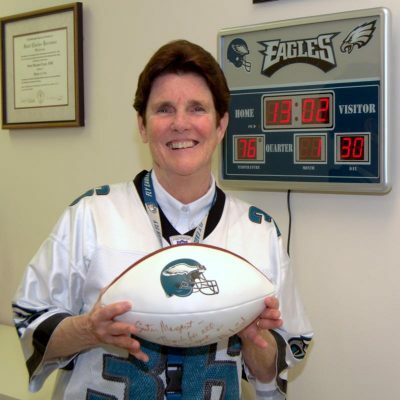 For “Dress-Down Day” during Catholic Schools Week Jan. 28-Feb. 3, Sister Margaret wore the jersey of her favorite team — with the number 36, for Brian Westbrook, former Eagles running back. Some students likewise donned Eagles fashions. In 2009, for her silver jubilee as a member of the Sisters, Servants of the Immaculate Heart of Mary, a friend wrote to Andy Reid, former head coach of the Eagles. His return letter of congratulations now hangs on her wall in a frame. Two years later, when the team was playing the Dolphins in Miami, the school asked the Eagles to attend a school pep rally — and a teacher upped the ante by sending a booklet touting Sister Margaret as the team’s biggest fan. The timing didn’t work out for a visit, but Reid autographed the book and sent a signed football inscribed with “Sister Margaret — Thanks for all the support and prayer.” The ball now sits in a clear plastic case in her office. The Eagles have always been on the side of the angels for Sister Margaret. Raised in Philadelphia, she joined her late father and her brother, Jack, in watching the games on TV. She described something like a Sunday ritual: early Mass, then breakfast, then preparing for the game. That included special foods like soft pretzels and Philly cheesesteak sandwiches. Everyone even had a special place to sit as they watched. Each summer, the family attended Eagles training camp as well, no matter how hot it got. She and her brother, Jack, still go each year. “I think we’ve been Eagles fans from birth — from the womb,” she joked. Even after she entered her religious community in 1984, she found time to watch the Eagles during football season. Each summer she stays at a convent her order has in Philadelphia, and brings some of her team gear. “It’s like Holy Hour” while watching an Eagles game there, as she put it. After proclaiming her love for all things Eagles in an interview, Sister Margaret felt the need to add, “I love God first — God is my Number 1.” She said that sports — Philly style or otherwise — embodies solid spiritual lessons for Catholic students. Davis writes for the Florida Catholic, newspaper of the Archdiocese of Miami. NEXT: How much will expansion of ‘529’ savings plans help Catholic education?